This page features PTSD clinical research updates, specifically addressing treatment for military veterans and their families. The books, clinical guidelines, and articles published in peer-reviewed scholarly journals are primarily intended for psychologists, psychiatrists, and other mental health professionals. But anyone interested in the assessment and treatment of military veterans suffering from posttraumatic stress disorder (PTSD) will benefit from reviewing these publications. Posttraumatic stress disorder (PTSD) and alcohol misuse are commonly co-occurring problems in active-duty service members (SMs) and veterans. Unfortunately, relatively little is known about the temporal associations between these problems in the acute period following exposure to combat stressors. Discerning the temporal associations between these problems across the deployment cycle could inform prevention and treatment efforts. In this study, we examined the association between PTSD symptom severity and problem alcohol use in a large cohort of United States Marines (n = 758) evaluated prior to deployment and approximately 1, 5, and 8 months postdeployment. Results indicate that problem alcohol use was associated with a subsequent exacerbation of PTSD symptoms between the 1st and 2nd and 2nd and 3rd postdeployment assessments. PTSD symptom severity was associated with increased problem alcohol use between the 1st and 2nd postdeployment assessments. These findings suggest that problem drinking may lead to new onset or worsening of PTSD symptoms over time and that SMs [Service Members] with greater PTSD symptom severity upon returning from deployment may increase alcohol use in the weeks immediately following homecoming. This research suggests, at least with this cohort of U.S. Marines, that the causal relationship goes both ways. Pre-order from Guilford Press for $38.75 (List price: $45.00). 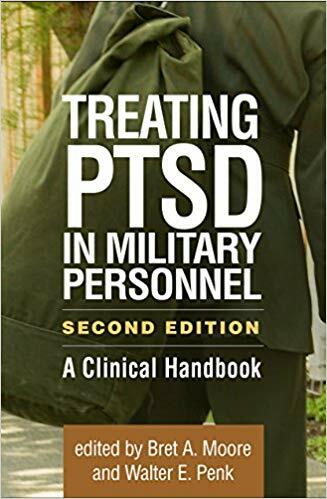 This state-of-the-science guide to assessing and treating posttraumatic stress disorder (PTSD) in active-duty service members and veterans has now been extensively revised with 65% new material. Leading authorities review available evidence-based treatments, including individual, group, and couple and family therapy approaches. Knowledge about military culture, the stressors experienced by service members, and common challenges for both military and civilian practitioners is woven through the volume and reflected in the vivid case examples. Chapters on specific clinical issues delve into co-occurring affective, anxiety, substance use, and sleep disorders; treatment of particular types of trauma; suicide prevention; and more. Chapters on additional treatments: mindfulness-based behavioral and cognitive therapies, stress inoculation training, cognitive-behavioral conjoint therapy, group therapy, and complementary and alternative therapies. Chapters on additional clinical issues: chronic pain, moral injury, complex traumatic stress disorders, and posttraumatic growth. Updated throughout with the latest treatment research and DSM-5 diagnostic changes. —Brian P. Marx, PhD, National Center for PTSD, VA Boston Healthcare System; Department of Psychiatry, Boston University School of Medicine. 1. Disabilities that are proximately due to, or aggravated by, service-connected disease or injury, 38 C.F.R. § 3.310.